I’m not a fan of Boyle’s hyper visual style. I thought his Slumdog Millionaire was the most overrated film of recent memory and the worst Best Picture Oscar winner in many moons. But even as a naysayer, I can’t deny he’s become one of the premier auteurs for the “ADD-Hey-Mom-Look-at-Me!” generation that’s grown up on reality shows. With Ralston’s harrowing true story, Boyle has finally found riveting subject matter to match his out-of-control eccentricities behind the camera. The film begins in traditional head-throbbing, loud, over-edited Boyle fashion as Ralston (James Franco, excellent in an essentially one-man-show) heads out of town for a weekend of rock-climbing and hiking through Utah’s Blue John Canyon. After a chance encounter with the lovely Kate Mara and Amber Tamblyn, Ralston once again heads off on his own and eventually falls down a crevasse with a rock that crushes his arm. Thankfully Boyle is not so hapless as to fail to realize that the natural beauty of the setting, the vast expanse of “wilderness” and Ralston’s singular drama should be the focus. When that focus hones in on one man’s dire predicament, Boyle enters a whole new ballgame. It becomes a film where silence is golden, and the noises that arise (the sound of Ralston screaming, rocks being chiseled, bones cracking, thunder rolling) evoke an “in-the-moment” jolt to the audience. With Simon Beaufoy adapting Ralston’s book Between a Rock and a Hard Place, many of the same themes and slapdash maudlin treatments as Slumdog Millionaire are present here, but they work for the most part in the context of the reality of the film’s major conceit. With Franco’s gonzo performance and Boyle’s kinetic bravado working in close tandem, Ralston’s story becomes one of an almost hallucinogenic descent not into madness…but survival. There’s touching and revelatory flashbacks to childhood, family life and romance (in the broken-hearted shape of the ever-alluring Clemence Poesy) coupled with premonitions and fever-dreams all leading up to that horrifying moment where Ralston makes the decision to saw off his own arm with a pocket-knife. The film’s final moments after he breaks free are an uplifting montage capped by real-life images of Ralston alive and well with his family. The dude never gave up, and in his lust-for-life madness Boyle finds his inspiration and redemption as a filmmaker. Real survival stories — not flimsy and fabricated ones about fame, fortune and exploitation — they are where it’s at, Danny. 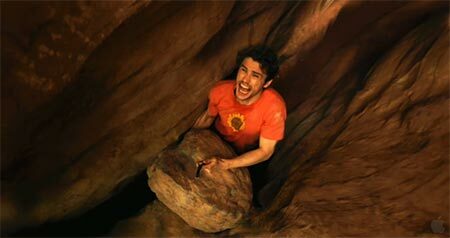 With that being said, 127 Hours is Danny Boyle’s finest film and his most authentic artistic achievement since Trainspotting. This entry was posted in Art-house Cinema, Book to Film Adaptations, Inspiration, Movie Reviews, Movies and tagged 127 Hours, Amber Tamblyn, Aron Ralston, Between a Rock and Hard Place, Blue John Canyon, Clemence Poesy, Danny Boyle, James Franco, Kate Mara, Simon Beaufoy, Slumdog Millionaire, Trainspotting, True Stories, Utah. …that might be so, but I’m not sure a film that is ultimately about one man’s decision to saw off his own arm is the sort of thing we need to see (or hear about). I’ve seen a documentary about the real life guy and his return to the place where he was trapped and that was tough viewing – his graphic recollection of breaking two bones (in two seperate horrific attempts), sawing through skin, nerves etc., is enough to hear about let alone re-live. The flashbacks idea puts me off immediately – makes me think, like I expected, that 127 hours of nothing happening has nothing of cinematic value, requiring the need for back-story through flashback. I haven’t seen the film but right now I have no intention of doing so until it comes on TV, or someone lends it me on DVD. I totally understand he’s a brave soul but his ordeal doesn’t have, from a narrative perspective, the more interesting tragedy of say Alive. Taking nothing away from his story it just doesn’t sound like a movie. That said, when I do eventually see it, if Danny Boyle pulls this off and keeps me interested then it might well be his greatest achievement. I was a little surprised to read your review and then see you gave the movie a “B” grade. It seemed you liked it a little more than that. Or maybe I’m projecting my own enthusiasm for the picture to your review. I really didn’t want to see this movie, but circumstances put me in a seat and I was surprised at how much I liked it. I would grade it high than you, probably an A-. I don’t dislike Boyle’s work as much as you. I think his style works for lots of things (TRAINSPOTTING and 28 DAYS LATER especially) and I thought it really meshed with this potentially static project. I also disliked SLUMDOG MILLIONAIRE intensely, but I was more off-put by the ridiculous script notably missing an Indian writer. But Boyle’s direction didn’t turn me off. I also disagree with his dismissal of the movie based on the inclusion of flashbacks. I’m not sure what he was expecting to see in a movie about a man trapped in a confined space for 5 days. I’m sure Ralston’s book recounts many of the memories he relived. What Boyle does that is so clever is not give us fully formed scenes in the flashbacks. They are snippets of memory, brief glimpses at things that happened in his past, often taken out of context. We in the audience are left to fill in the blanks. That was a great way to go as anything more would have disrupted the narrative and taken us too far out of that ravine, which Boyle decidedly wanted to keep us in as much as possible. OK, I’ll stop rambling now. Suffice it to say I really liked this movie. Hey, shall we have some fun and rank ole’ Danny B’s filmography? OK David, very fine review here. I liked the film a bit more, but as you’ll recall we never connected on SLUMDOG MILLIONAIRE, which I liked a lot. I’d heard a little bit about this film, but not enough to know what it was really about. Sounds like a pretty amazing story, although probably quite a work out for you emotions. Exciting to see James Franco in a role like this, he has that air of a great actor weho hasn’t had a chance to flex his muscles yet. Finally! I saw this one. And there is not a single point in your review which I don’t agree with. Your review is spot-on.